Budweiser got pretty patriotic during Memorial Day. In a honorable move, Anheuser-Busch rejuvenated Budweiser’s patriotic packaging. This summer Budweiser will make its largest contribution to the Folds of Honor Foundation through a series of events including a summer Clydesdales tour, special Fourth of July ceremony, and Charity buzz partnership. Budweiser is also launching an even larger commitment to helping military families by donating more that $3 million to the Folds of Honor Foundation with its wholesaler partners. With each educational scholarship valued at $5,000 Budweiser estimates that the donations will provide more than 600 scholarships to families of soldiers killed or disabled in action. Since first partnering with Folds of Honor Foundation in 2010, Budweiser and its wholesalers have raised nearly $10 million for military families. 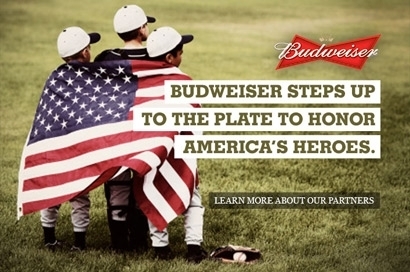 The beer maker is encouraging the rest of the company to participate in supporting military families with a series of auctions at CharityBuzz.com/Budweiser. Here a bid can be placed on numerous exclusive experiences by Budweiser, including a go-cart race with Kevin Harvick, the MLB All Star game, Super Bowl XLIX and Budweiser Made in America Music Festival. The world-famous Budweiser Clydesdales will honor this year’s scholarship recipients with a series of personal scholarship deliveries. “Budweiser celebrates America and our military every single day, but this summer is especially important as we welcome thousands of troops home from overseas,” said Brian Perkins, Budweiser’s Vice President. I’m now feel pretty patriotic and wanting a beer… all at the same time.